What types of animals are placed into foster care? Animals that are not yet ready for adoption are placed into foster care. 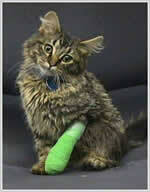 They may have a minor illness, may be too young or may be recovering from an injury. We also send animals that need socialization or some basic training. The program includes dogs, cats and rabbits. What if I only want to foster a particular type of animal, such as kittens? I am away from home sometimes. Is this okay? What should I do to prepare space for a foster animal? Isn't it hard to say goodbye to foster animals? Yes, you may foster animals if you have companion animals of your own. Foster animals will need to stay separated from your animals to reduce the risk of disease transmission. WHS provides food, medication and veterinary care for foster animals, but not for your own animals should they become ill. Routine vacinations and simple precautions are usually all that are needed to keep everyone safe. Volunteers may specify which type of animal will best suit their experience and circumstances. Some caring people are willing and able to take in a mom and litter of puppies or kittens. Every home helps! A reasonable amount of time to be away from an adult animal or litter of kittens on a regular basis is 8 hours. Young puppies, ideally, should be let outside at 4 hour intervals. Medications are normally given two to three times daily and can easily be scheduled around work or other commitments. Animals need a quiet, warm and safe space. Dogs should be crated when they are left alone. Cats should have a room with a comfortable place to sleep, food, water and a litter box. Plants, electrical cords, and other hazards should be made inaccessible to all animals. The home visit allows an experienced foster home volunteer or WHS staff member to evaluate the space you will be using for the foster animals. They will help you understand how to best keep your own animals healthy. The volunteer will thoroughly explain the program, including expectations, health and medical issues, animal behavior and training techniques. The home visit is a great time to have your questions answered. Part of the joy of fostering is knowing that the animal will get a great new family that will truly benefit from your efforts. And, if you get lonesome, there will always be another animal that needs your help. If you would like to become a Volunteer Foster Parent, click here to fill out an on-line foster application. You can also call or email our Volunteer Coordinator, at (414)431-6103 with any questions.